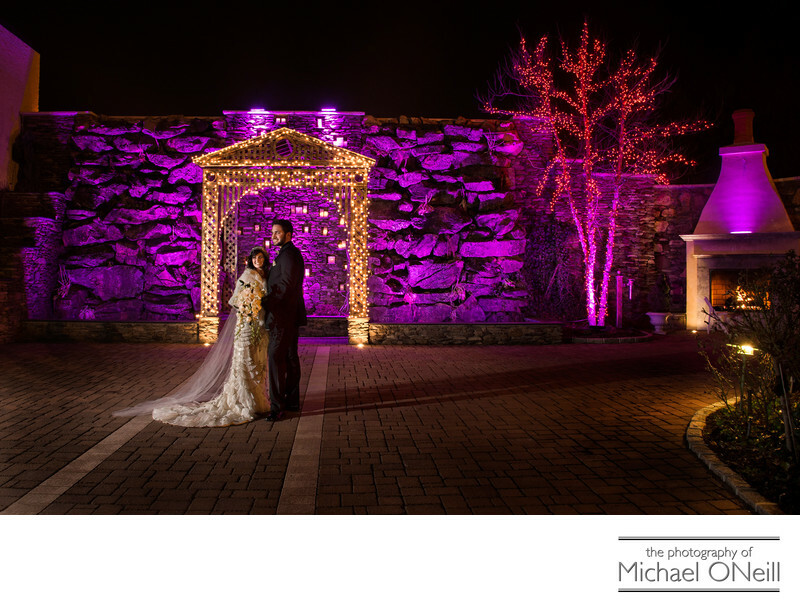 A beautiful wedding image taken on a cold winter evening just before Christmas. The location is the amazing Fox Hollow Inn in Woodbury, New York…right on the Nassau and Suffolk county border on Long Island. The patio outside the exquisite Somerly Room has LED uplighting, in ever-changing colors, illuminating the rock wall waterfall. Outdoor wedding photography in the winter? If that is the bride’s choice then it shall be done. Though there was no snow on this occasion, there was very low temperatures and gusty winds. This couple didn’t seem to mind one bit. They wanted to take advantage of the amazing outdoor gardens all around the Fox Hollow’s grounds. After capturing a series of photographs at this location; all different on account of the ever changing colors of the lights; we wandered over to another spot on the grounds where a magnificent fountain erupts from a pond which is crossed over by a quaint bridge between the catering facility and the hotel, of the same name, next door. The Fox Hollow Inn is conveniently located just 15 minutes from my East Northport, NY studio so I find myself working here many times throughout the year. In over 30 years in business as a Long Island, and NYC wedding photographer I have found myself at the Fox Hollow more times than I could ever remember. I am familiar with every square inch of this awesome property and never fail to deliver amazing photographs to every bride, groom and wedding party I’ve ever photographed here.